Here are some of the things I've knit. A pair of socks out of a 6ply Regia North Pole colorway and, since I am attempting to use all the yarn until it is gone, 2 hats...the last of the yarn went into pompom - yeah, no leftovers! Am having trouble focusing on what will be my next big project, so have been working through some samples of yarn various sales reps have left. 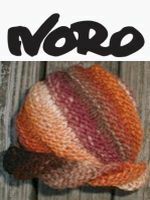 I liked the first vertigo hat so here it is again in Noro Ayatori. Love the feel of this yarn, might make a great chemo hat. Occasionally I will do a custom knit and have been making stockings for this family for quite a few years. This is one of the Googleheims kits. Thankfully she ordered well before Christmas. My Mountain is having a contest for projects using their yarns. All of these items were knit with one ball of Regia 6 ply striping yarn. Back in the 1980’s a customer had bought a golf cart mitt and wanted a pattern for it, so I carefully took it apart a wrote a pattern. Not sure anyone uses golf carts anymore, so we call it a walking stick mitt, of course we have no walking stick so for photo used a broom. 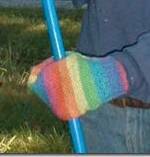 Then a couple years ago I made it a bit bigger for a tailgating mitt. Needed something for the other hand and wondered if I could figure out how to get exact color units in entrelac. Still had some yarn left over...ok, how about a headband? I started at one end because I wasn't sure if I'd have enough yarn to finish, but to get design centered it probably should be started in the center. There are still 2 tiny balls of yarn left that could be used as tassels on the headband or more likely for stitch markers! If interested in the patterns, I will need to rewrite them for the gauge of this yarn. Some critters decided to eat my 10 yr old felted clogs this summer, so need new slippers as our floors are really drafty. Found this pattern on internet...not well written as had to restart a couple of times, my not interpreting what she was saying correctly. And, if I make again will decrease earlier on the areas over the toes as there was not shaping there and they are same width all the way down and are a bit bunchy after the arch. But they will solve the problem for now and I will enjoy tonight! Made with Noro Kureyon and 3 trips through the washer to felt small enough. 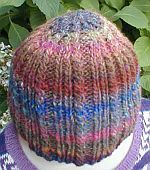 This is a hat called vertigo...and since I have had vertigo for the last 20 yrs decided it was appropriate for me to make. It is made with Noro Cyochin left overs from another project. 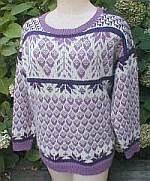 The pattern is available free online. From Elsebeth Lavold's new book Viking Knits and Ancient Ornaments, knit with Antique Rose Favorite Wool and with a few adjustments to fit my short wide body. Like the way it came out! 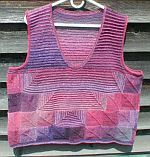 Finally decided on charts and with all the wonderful colors of heather Herriott, finished this last night. 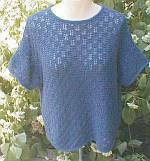 I do have a quick and dirty pattern in sizes 42 and 48; please ask if you are interested in a written pattern. 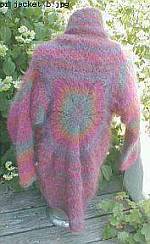 Knit in Noro Silk Garden. The original vest made in 2001 has been one of my favorites, but with weight lost it could now be worn double-breasted. Time for a new one! 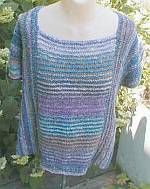 This is a revision of my T-Cardigan pattern knit in Ella Rae Seasons. A size 48" took just 5 balls of yarn - only a few yards left, though, so if making longer or bigger will need 6 balls. Knit in Dale Garn Lille Lerke. This wool/cotton yarn is really nice to knit with and feels nice too. This was a quick knit as is worked on size 5 needle and only takes 2 balls for the 0-6 month size. 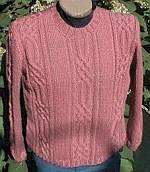 This is a free pattern from Knitting Fever. Obviously this is not blue but Painted Desert color #19. I used 2 balls for a medium size. Sorry the body looks a little bit lumpy, I need to pad out this small mannequin to be closer to my size and the bubble wrap made it a bit lumpy, it might hang better on me? Revontuli is Finnish for Aurora Borealis. 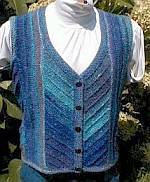 This is a free pattern on Ravelry - Viking Nordlys color 965 seemed to be the perfect colors. I don't do much lace knitting as I knit at night and brain wants simple patterns - this is very predictable, so only had a few times when a stitch went missing and was easy to fudge where to add back in. I also missed the directions for the ending of shawl and didn't want to take back so just did 6 rows of garter stitch. The cool thing about this design was last week when I was finishing it up I was watching a PBS show about the Northern Lights...seemed cool to be knitting a design with same name! I love the way it came out! Afghan I made for grand daughter Faith for her high school graduation. 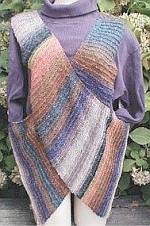 The design is 15 stitch wide zig zag strips, based on a free download on Ravelry that uses 10 stitch strips. The designer asks for a donation to liver cancer research. 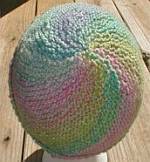 This is made out of 13 balls Painted Sky color 203 imported by Knitting Fever. I made 48" wide by 66" long so she could use on bed if she wanted to. Needed to let her know laundering so I washed on delicate cycle with cool water and delicate dry for 10 min...came out just fine. 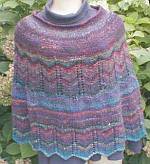 Finished another project, a tam and shawl out of Mirasol Paqu Pura using pattern M5044. Paqu Pura is a 100% Alpaca yarn in 10 wonderful self striping colors. Great for shawls and scarves....8 patterns available that include vests and sweaters. Is a cozy soft snuggly yarn. This pattern calls for new Mirasol Sami yarn, however the company hadn't sent any of that to me yet so I made one out of Noro Silk Garden Lite. It took 7 skeins for a 46" vest. It looks better on my big body than on this skinny mannequin! This is knit in Noro Mossa yarn. Had a hard time figuring out how to make this larger as it has a different construction. Finally decided to add 3 sts to the length of the bottom back section and it is about 43" now but hangs okay on my larger body. A fun knit for wondering what the heck is going on! This is knit in new Noro Cyochin yarn. It is close to being what is in the book. I missed a line and have the second lace pattern too long so needed to shorten the top stockinette stitch by a few inches. I also managed to pick up the wrong color of yarn one night, didn't see the difference until it was too late. So there is colorway 2 at the bottom and colorway 7 on the top, amazing how well they go together! This yarn even though it is called aran, is dense enough to knit as chunky yarn, so be sure and check your gauge. Luzia is a fun new furry yarn to play with! Is in ten colors: 5 jewel tones and 5 animal fur like colors. 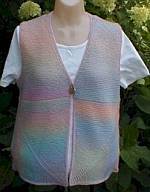 There is also a new book to support it with collars, vests, jacket, and cape patterns in the book. Sweater knit in Euro Babe Stripe from book EY 110. A few minor changes: I worked in one piece so the colors line up all the way around and I knit a garter stitch edge along both fronts so it would be less likely to curl. This is a really easy quick knit baby sweater! Sweater knit in Euro Babe Print. Pattern is a variation of design 4 in book EY 106. I liked the picot edging enough I decided to put it at the neck and I can make nicer buttonholes in garter stitch than ribbing. 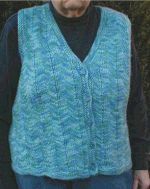 Since there are garter ridges several places in the sweater, this does not add another design element. This is a sample scarf of new Noro Shiro in colorway #2. I diagonally knit 25 stitches until I used up 1 ball of yarn. The scarf is 4" wide and 42" long. Very nice yarn to knit with and wonderfully soft! Pattern now available. I knit this in Noro's new Cyochin yarn. It looks like there might be enough to make the mitts in the same book - about 1/2 ball used to make the men's hat. I saw design 10 in the Noro Spring magazine and really liked it. Trouble is at only 5' and 48" around, the vest would have been long enough for me to sit on it...so out came the quadrille paper to see how I could come up with something similar to work for me. I changed the yarn to Kureyon sock yarn, a 3" square would get me the 48" I needed...so marked that out on the graph paper. 4 rows tall would get me a good length vest after adding some garter stitch around bottom to tidy off. I made deeper armholes, like the stitches taken off at center of v neck and this seems to keep the lines straight and not hike up like in some v necks. It is not the same, but I like and I can wear! So, if you see something you like, use the best elements of the designs and make it work for you! Dale Garn brought out Royal Alpakka a couple of years ago, I kept thinking that it would work in all the old Tiur patterns if they had the right colors...so finally this summer, I knit Kongle and love the way it came out. I used 5 each of #10 and 4435, 2 #4845 and 1 #5563 for a 48" sweater and had plenty of yarn left over in all the balls. My gauge was okay in stockinette stitch but -- brain getting old -- I forgot to swatch in pattern and the sweater came out about 44". Guess that is more incentive to lose some more weight, I love the sweater. Changed the ribbings to a color rather than white so would not feel like I had to wash all the time, and like the way it frames the sweater. Also changed the pattern at the bottom to match the pattern on the sleeve. Made of Hempathy, this is the first time I have made anything with this yarn, guess I thought it would take to long in my size...I was surprised how fast it knit, now I need to buy some navy pants to wear it with, I am about 6 sizes smaller than I used to be and don't have much that really fits anymore, but I hate shopping! Liz Lovick lead a pi shawl or vest started on Pi day in March...I normally do not do this kind of thing as I never seem to finish...but was intrigued...this one done with the correct yarns is fabulous, but I knew I would never finish a lace anything. So, been wanting to try a swirl coat and this is pretty close, I have a couple of mohair sweaters I love to wear and they are wearing out as I live in them in the winter, they are so light weight and warm. Reynolds Fusion has been discontinued and this was the only color left that I had enough of....don't really like this color but so be it. 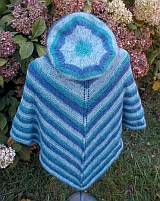 The pattern is available on Ravelry, look under Liz's name. After it was done I decide to add sleeves and did top down set in sleeves, now I have a cozy wrap to wear this winter! Saw this free download from KFI...after doing the pi jacket I was still intrigued by circles...so, had to make this work. 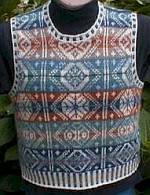 Problem is I am short and wide and the design is for someone slim and tall...for a circle to be complete under the arm for my size, the vest would be 33" long... not something I would ever wear. Chose a color of Taiyo Sock Yarn so I could maybe wear this summer, cut out a circle of kraft paper 24" in diameter and figured out what I had to do to get this to be a vest. It is actually a octagon rather than a circle, so one section of the octagon became the armhole and I proceeded to knit to the paper pattern. Made two pieces, bound off together another section of the octagon the put the two pieces together. Then, filled in the upper and lower back doing what would lay flat. Finished off all the edges with I-cord. Added the button, it is a bit small but am still losing weight so it will be okay, can wear as it is. Fun sometimes to just start knitting something and have it actually work out! I knit in Chirimen as it is less dense than the Koromo called for and will be more comfortable in Virginia weather, and I happen to like the colors of Chirimen better than the Koromo. I got the same gauge so did not have to alter the pattern and used one less ball than was called for. The neck is a bit wide for me, so I need to pick up the stitches around the neck and work a few rows of garter stitch to make it smaller. Otherwise I really like the way this fits, I think it will get a lot of wear and will go with about any color of pants! When I saw the colors in this yarn, it reminded me of ripples in water so I wanted to come up with a stitch that resembled that. I like the way the vest looks, however it was not the wisest choice of a stitch as it torques about 6", which pretty much blocked out but don't know how long it will hold. 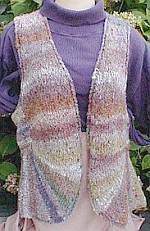 Doubt if I will write the pattern because of the torquing however if you want to use Juniper Moon Farm's Marlowe in a garment, this 48" finished size vest just went into the 5th ball to finish the front button band. Finished my sample of the cover sweater in Noro City Girl...made it somewhat larger to go around my body, narrowed the shoulders so it would not extend beyond edge of my shoulders, and only used 9 balls of yarn to make a 48" vest. The colors in it remind me of a great sunset, I used Kama shade 8.